We are Part P Competent company status under the Part P Competent Person Scheme with the NICEIC [Electrical Contractors Scheme]. This means that our work and the certificates that we produce] have been assessed by NICEIC and deemed to meet the required standards. This assessment takes place every 12 months to ensure that we continue to offer you, the customer, the best services possible. 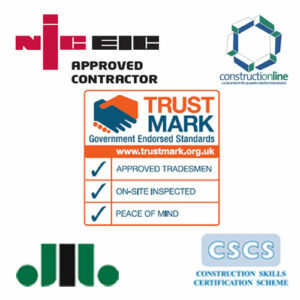 The assessment takes the form of a complete review of our work where we make available all of our contracts, test certificates and also a selection of sites where we have completed electrical installations for the Assessor to review. Usually the Assessor will chose a random selection of contracts and certificates to audit for accuracy. He also visits two sites where we have completed electrical work, or where work is currently in progress, to check that our live work is of the required standard. The remainder of our assessment involves the Assessor satisfying himself that we understand all the relevant regulations that apply to our work and that we have appropriate information available for our customers, including detailed contracts, safety information and material regarding insurance-backed warranties. We are also required to prove that we have appropriate liability insurance. So – you can be assured that we have the relevant skills and qualifications to complete work in your home or business, and also that we undergo a rigorous assessment every year to maintain our status as a Competent Person. If you have any questions or concerns then please ask and we will explain further. Remember – you can always take up one of our customer references and see what a previous customer thought of our work. All of our work is covered by a guarantee – call us today and ask us about it!